The Duke and Duchess of Sussex have attended a Buckingham Palace garden party for their first royal engagement as a married couple.The duchess wore a dress by Goat and a hat by Irish milliner Philip Treacy to the party, which was part of the Prince of Wales' 70th birthday celebrations.Prince Harry, 33, and Meghan, 36, were married at Windsor Castle on Saturday. The couple have not yet celebrated their honeymoon. The location and date has not been revealed. The garden party, which is being held six months ahead of Prince Charles' actual 70th birthday in November, celebrates the future king's patronages and military affiliations. Prince Charles and the Duchess of Cornwall were joined by more than 6,000 people from the charities he supports.And to mark the one year anniversary of the Manchester Arena bombing, emergency service workers who were on the scene on the night of the attack also attended. Giving a speech to guests, Prince Harry opened with a moment of remembrance for the Manchester attack victims before fondly paying tribute to Prince Charles' "infectious" energy and enthusiasm for his charity work. "It has certainly inspired William and I to get involved in issues we care passionately about and to do whatever we can to make a difference," he said.He added: "Pa, while I know that you've asked that today not be about you, you must forgive me if I don't listen to you - much like when I was younger - and instead, I ask everyone here to say a huge thank you to you, for your incredible work over nearly 50 years." During the speech, Meghan and the Duchess of Cornwall started laughing when a bee flew close to Prince Harry and he said: "That bee really got me." The Duchess of Sussex's dusky pink dress is from British fashion brand Goat, which is often worn by the Duchess of Cambridge. London-based milliner Philip Treacy is popular among the royals.Prince Harry wore a morning suit and a silk top hat. Among the guests at the party were personnel from the 2nd Battalion, Irish Regiment of Canada, who flew over especially for the party.Second Lieutenant Reid Killen said: "It felt like talking to my youngest son, the Duke reminds me very much of him. He's always joking around and Harry has the same sense of humour. 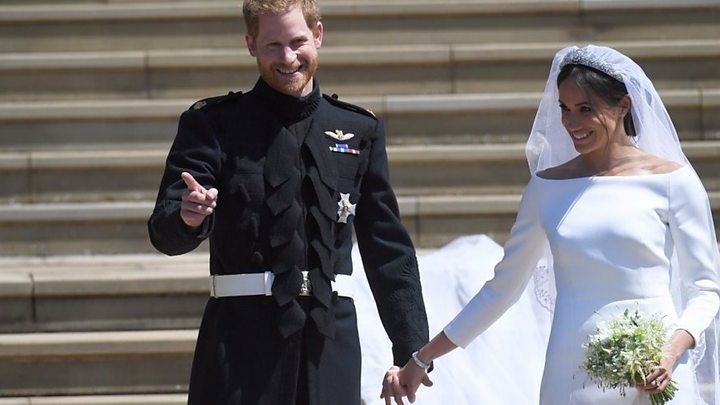 "Meanwhile Jyoti Bahia, 25, a project manager joined by four colleagues, said: "That was incredible, there are no words to describe the feeling of meeting Harry and Meghan after their wedding. "On Monday, the newly-married royal couple released three official photographs - including of bridesmaids and close family - taken on their wedding day. The Duke and Duchess, who left Windsor on Sunday, also thanked everyone who took part in the celebrations, which were watched by an average of 11 million viewers on BBC or ITV at any one time.More than 110,000 people also filled the streets of Windsor.Following a lunchtime reception, the evening celebrations saw a black-tie dinner and fireworks display at Frogmore House, near Windsor Castle. The evening refreshments are said to have included themed cocktails, including one named "When Harry met Meghan" - referencing the romantic comedy starring Meg Ryan and Billy Crystal.Guests dined on posh burgers and candy floss, according to reports, and danced to music provided by a celebrity DJ. » Royal wedding 2018: What titles might Harry and Meghan get?